But it does present the awful truth. 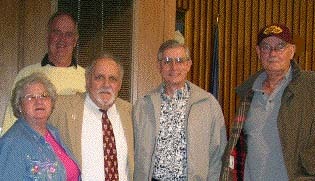 Left to right  Barbara Stone, John Barber, Andrew Barbano, Floyd Dean and Noel Thornsberry in the Reno Council Chambers after a recent meeting. The City of Reno's Citizens Cable Compliance Committee will now meet at new city hall, the black tower downtown at First and Sierra across from the Mapes Memorial Graveyard. 10-25-2004  An inquiry about why our Oct. 28 cable meeting does not appear on SNCAT's schedule brought this response: "I did check with (Executive Director) Vivienne French and the Citizens Cable Compliance Committee is not a meeting that has been negotiated in our new contract with the City of Reno as one that will be covered on a regular basis. In addition, at this point we have not received any request from the City of Reno for coverage." UPDATE 10-27-2004  Councilmember Jessica Sferrazza's office called to say it was a mistake and will be rectified in the future. We now have a committee vacancy to fill. Any Reno resident wishing to serve may contact City Clerk Lynnette Jones at (775) 334-2030 for an application, or apply via the city's website. We will meet quarterly in 2005. CCCC AUGUST 26, 2004 MEETING: Set your reminder to SNCAT TV-13 on Sparks-Reno Charter Cable for reruns of this seminal meeting this Saturday at 2:00 p.m. and Sunday, Aug. 29, at 7:00 p.m., same station. Tune in, turn on and tell a friend. The committee considered some very important issues. One of the board members discovered flaws in Charter's recently imposed regionwide rate hike. City staff is reviewing the facts of the case. We also approved a sweeping and visionary proposal to recommend to Sparks, Reno and Washoe County governments that they develop a contingency plan should a troubled cable provider collapse or otherwise fail to provide service. I strongly suggest that everyone read it. (See the Barbwire of August 1, 2004, for one looming scenario). CHARTING THE FUTURE AT CITY HALL. On lucky Oct. 13 at the new downtown black tower, the Reno City Council will hear a recommendation from its Citizens Cable Compliance Committee, which I chair. Given fast-breaking new technology, a prejudicial new 15-year franchise agreement and Charter Communications' chronic financial troubles, we have advised the city to develop a long range cable backup plan in conjunction with Sparks and Washoe County. As I reported on Aug. 1, further complicating matters is Charter's new digital system in Long Beach, Calif. The company recently unveiled technology to bypass any cable regulation by calling everything broadband Internet service. City staff, as always, has recommended that the council turn down the citizens committee's very detailed proposal. I need your support. Contact the council, three of whom are seeking re-election, and tell them to give us some insurance against a major new abuse of consumers by our local cable monopoly. If you can't make it to the meeting, you will be able to see reruns through the weekend on SNCAT cable channel 13. Full details and contact info at DecidingFactors.tv. In an e-mail bulletin to the aggrieved cable consumer mailing list, I included the following humorous aside: "Please keep in mind that if Tom Ridge takes the nation to Orange Alert, the very vulnerable Stewart Street door on the south side of city hall will be locked in order to keep them nefarious freedom haters from striking at the heart of democracy." Alas and alack, life imitates art. I got this response from City of Reno Chief of Staff Leann McElroy: "Andy: Under our new security procedures at the old City Hall, I believe that everyone attending the meeting will have to enter through the Center Street door." With Tom Ridge and John Ashcroft monitoring everything, I feel so safe and warm. At the beginning of the above meeting, Councilman Dave Aiazzi defended the city's actions in giving Charter Communications a new 15-year franchise. Chairman Barbano's rebuttal may be accessed hereat. despite 3 town hall meetings, 3 Gazette-Journal Internet polls, KOLO TV-8's web survey, letters to the editor, massive e-mails, paper letters and phone calls to councilmembers. A 244-page legal brief filed by the nation's largest and most powerful cable company in its recent suit against the City of San Jose, California, reveals its profound indifference to the public good. San Jose's conditions for continuing its cable franchise include expanded public interest programming, community network access to the Internet, fiber-optic lines to serve the city, and compliance with living wage, non-discrimination and other social justice laws. Comcast in its brief rejects each of these requirements as a violation of its First Amendment rights. You can learn more about this case and what action to take at the Center for Digital Democracy website. Charter "failed on every level"
Watch this website and Barbwire by Barbano in the Sunday Sparks Tribune and Thursday Comstock Chronicle for updates. Click here to request placement on our mailing list. Got a gripe? E-mail it to us. We're finding that use of e-mail expedites matters. * Click here to download the city's new complaint form. For info on the complaint process, download here. Both of the latter require Adobe Acrobat Reader, which you may download here. Let us know how your complaint is handled. * UPDATE: SELF-FULFILLING PROPHECY  Stung by Cosmetic Cable Compliance Committee inquiries, the howling of city staff and Charter's cheapsuits, the city council quickly removed the committee's authority to intake and handle complaints. The predictable result  When the generous new 15-year franchise was rubber-stamped on April 7, 2004, Councilman Dave Aiazzi was able to trumpet that only 14 complaints had been received under the city's vaunted new intake system. Despite month of repeated requests, city staff never provided any such data to the committee for review. At that same 4-7-04 meeting, the council refused to take action to better inform ratepayers about how to file a complaint..
Keep that positive spin coming in! "City getting best of Charter deal"
Charter files for complete deregulation in Reno, Sparks, Carson, Washoe and Clark counties. Municipalities must file objections by Nov. 28, 2004. The most progressive community in the USA? Does wi-fi cure winter cabin fever? Perhaps because tiny Truckee, Calif., (on Interstate 80 near the Nevada border on the way to Lake Tahoe), frequently suffers the coldest temperatures in the nation, its residents need the hottest Internet access. TRUCKEE, Calif.  (Business Wire)  Oct. 15, 2004  The Truckee Donner Public Utility District's (TDPUD) broadband system will continue to move forward after the Nevada County Local Formation Agency (LAFCo) unanimously voted to deny the request for reconsideration brought forth by Cebridge Connections (formerly USA Media) at a special meeting October 14. Cebridge formerly requested the reconsideration of the original unanimous approval in August, temporarily stalling TDPUD efforts to bring fiber-to-the-user broadband to Truckee residents. LAFCO's dismissal of the request allows TDPUD to move forward with plans, which immediately entail securing financing. "We're extremely pleased with the commissioners' decision," Alan Harry, telecommunications director for TDPUD, said. "Cebridge brought nothing new or relevant to the table. Like other cable television companies across the country, they were just seeking to stall the District's entry into the broadband business. Now that we have met all regulatory requirements we can focus on the real work of bringing a community fiber system to life." LAFCo commissioners reviewed further documents related to the previously approved business plan, as well as more than 60 letters of support from Truckee business and homeowners. The Truckee Donner Public Utility District has a proven track record of providing reliable, reasonably priced water and electric services for the last 75 years. The District, owned and controlled by its customers, is governed by a five-member Board of Directors, each elected to serve a four-year term. District Board meetings are open to the public and are held the first and third Wednesday of each month, 7 p.m. at the District's headquarters. For more information about the District's proposed broadband project, contact Alan Harry, director of telecommunications, at 530-582-3951 or alanharry@tdpud.org. "...Soon, Truckee, Calif., is expected to become the first of more than 570 planned municipal broadband utilities in the country to be backed entirely with private funds. It plans to use the more complex certificates of participation. "'It's almost like a revenue bond, but it has a leasing structure to it built on the project and the revenue to be derived from that,' said Laurance Lewis, principal of Lisle-based Aggregate Networks, which is a financial adviser to Truckee. "Truckee officials plan to issue $24 million in certificates with a 15-year life span that is expected to garner an 8 percent interest rate. So far, the high-interest rate and the fact that it's exempt from state and federal taxes has stirred up a lot of interest, Lewis said. "If voters approve advisory questions in St. Charles and Batavia and a binding question in Geneva, the details would then be worked out. "Though SBC and Comcast have said a broadband utility puts taxpayer money at risk, city and elected officials and supporters of the plan believe otherwise. But they concede the Tri-Cities would be treading relatively new ground. "'We are pushing the envelope as far as financing,' Snider said. "Broadband: SBC, Comcast contend utility plan puts taxpayer money at risk"
ALSO FROM THE ABOVE ARTICLE: "...if voters approve plans for a municipal broadband effort in the Tri-Cities, those will be the next steps  and contrary to SBC and Comcast ads, Geneva City Administrator Phil Page says the utility can "very definitely" exist without risk to taxpayers. 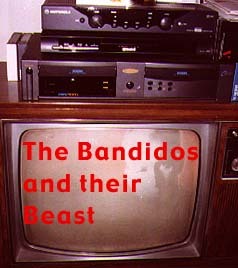 The major difference between the referendum efforts for a Tri-Cities-operated cable TV, high-speed Internet and telephone system via fiber-optic lines that were defeated in April 2003 and those on Nov. 2 ballots is a shift from public to private financing..."
The above story carries loads of links to additional resources. paper letters and phone calls to councilmembers. What's a mere $2,300 between friends?